Shanghai is the largest Chinese city by population and the largest city proper by population in the world. It is a global financial center, and a transport hub with the world's busiest container port. Such a big city, there are various people from all over the world. The traditional culture of Shanghai and the diverse cultures come with various immigrants have mixed together, forming a unique culture in Shanghai. A lot Hui people are Muslim people are throughout Shanghai. 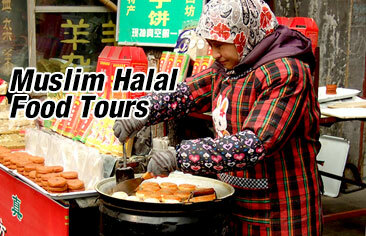 Halal food, therefore, in Shanghai has a great development. The following are some famous halal food restaurants in Shanghai. With a history of more than 100 years, Hong Chang Xing is the oldest Halal restaurant in Shanghai. In preparation for the 2010 Shanghai Expo, the restaurant gave itself a brand new makeover. The restaurant consists of four floors and its spectacular interior is definitely something to feast your eyes on. Unlike other hot pots which consist of heavily seasoned oil soup bases, Hong Chang Xing’s hot pot is made with plain water. To season the soup base herbs, vegetables and meats are added. Moreover, the hot pot is heated using coal unlike many modern hot pot restaurants which now use electricity. Among those many Halal restaurants and Xinjiang restaurants, Oriental Ya Ke Xi Restaurant stands out by its own uniqueness. It has not such an attractive appearance. Dining at such a nice environment would definitely give you a relaxed and enjoyable mind. As for its food, customers speak highly of its authentic flavors. Those northwest styled Xinjiang Muslim food would cater to your stomach and mouth. Mutton kebabs and big plate chicken are the must to try. Aladdin Halal Restaurant is a famous restaurant that specializes to provide authentic Indian food in Shanghai. It is located in Causeway Bay area and is quite popular among customers by its delicious and amazing IndianHalal food. Mango lassi is a dish loved by many loyal customers. Curry lamb, chicken tikka and fish tikka are hot recommendations from Aladdin Mess. If you want vegetarian dishes, there are also good choices. Gulixian Xiyuqing Restaurant is a Xinjiang restaurant in the city of Shanghai. It has gained wide popularity. At Gulixian Xiyuqing Restaurant, there are both traditional and innovative Xinjiang Muslim dishes provided. Those traditional classic Halal foods like the big plate chicken and mutton kebabs are quite popular. The innovative cooked French-style lamb steak, however, has tasty flavor and is a hot dish among customers. Braised sea bass with wild mushrooms and mutton rolled with pancakes are also star dishes in the restaurant. Yes, the special milk tea and yoghurt at the restaurant should never be missed out. Yelixiali Restaurant is a special halal restaurant with new concept. The restaurant is located in Xujiahui business circle with decorating chic and elegant environment. There are more than 300 seats, a rich dishes, fine materials and good taste. The roast lamb leg, French lamb chops and steamed shad are the most popular dishes. Nowadays, the restaurant also introduces western food, seafood, and Shanghai cuisines, delicate taste and exquisite plate, and there are many business dinners to choose from. The decoration design of the dining-room is fashionable. Xiyu Halal Restaurant is a well-known halal restaurant in Shanghai. It gains a high reputation for its authentic halal food, reasonable price, clean environment and the good service. Dinner time, the restaurant is always very busy. Most people come here to taste the signature dishes and other halal drinks. Sheep Giblets Soup, shish kebab, Western Milk Tea and big plate chicken always gain the most praise. Hui Wei Zhai is a restaurant that aims to make you feel about the halal style food and delicious dishes. The Hui nationality unique hospitality and warm make you feel the rich Muslim culture, let you taste the real halal food. Through the various cuisines taste, you can experience the real halal spirit. Hui Feng Lou is Shanghai's famous halal restaurant, an old and famous restaurant. The store can accommodate more than 100 people to have dinner in the same time, suitable for mass consumption. It gains praise at home and abroad for the exquisite material, fine cooking and unique flavor. The popular dishes are beef granules, lamb chops. Hui Feng Lou has a long history, and reflects the real western amorous feelings.